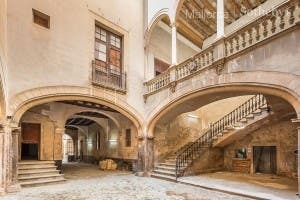 A STUNNING 12th century palace in Mallorca has been shortlisted in Billionaire magazine’s ‘seven most majestic properties on the market now’. The list, compiled in honour of the British Queen’s 90th birthday, showcases castles in Edinburgh, Staffordshire, Portugal and Siena. The Palma de Mallorca pile, in the heart of the old town, is a lavish 20-bedroom property based around a typical Spanish courtyard. With nine-metre high ceilings, grand arches and stairways, a library and a wine cellar, the €10.5 million house is fit for a rey.